Marilyn holds a senior position in a southeastern Michigan hospital system. She is an informed health care consumer. Even with her experience, she found herself in uncharted territory when her friend was diagnosed with a serious illness. Together, they were forced to navigate through a maze of care options, settings, and medication with little information or support. Unfortunately, this is a story heard all too often. The number of people providing “informal caregiving” is growing rapidly as baby boomers age and face the long-term, advanced illnesses that our healthcare system is not equipped to handle. Each day, about 10,000 people turn 65. November is National Caregivers Month — a time when the Coalition to Transform Advanced Care and its members recognize the acts of those selfless caregivers around the country. We reflect on how we can increase support for and awareness of them and their loved ones. Recognize caregivers — even though they are “doing what they always do,” as Marilyn put it. Social Security and the Coalition to Transform Advanced Care recently participated in a celebration of family caregivers hosted by the Alameda County Care Alliance. The event honored 200 people as caregivers. It was quite a celebration! Encourage people, like Marilyn, who take action. She is part of a movement led by people living with advanced illnesses, their caregivers, and spiritual leaders in southeastern Michigan. On November 15, ten churches in the Southeast Michigan Alliance to Transform Advanced Care dedicated their Sunday service to caregivers. Know your resources and plan ahead. According to NPR’s Your Money and Your Life: Smart Saving Tools, almost half of working Americans have less than $10,000 saved for retirement. Fortunately, Social Security helps the public plan for the future by providing estimated benefits with the Retirement Estimator. 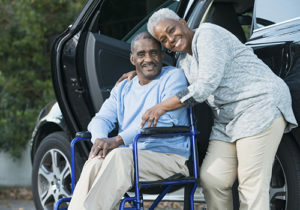 Social Security’s financial support provides peace of mind to millions of Americans, many of whom care for a loved one with an advanced illness. The Coalition to Transform Advanced Care and Social Security share a vision to protect the most vulnerable individuals and ensure that they receive person-centered care that honors their dignity. The Coalition is leading the national conversation on financial concerns for those with advanced illnesses and their caregivers. In celebration of this month and the beginning of the holiday season, the Coalition asks that you join the movement and find ways to get involved or simply let caregivers know how much you appreciate their efforts. This entry was posted in Uncategorized and tagged benefits, caregivers, Coalition, health care, illness, National Caregivers Month, retirement, Retirement Estimator, social security, Social Security benefits, Social Security Coalition, SSA, Transform Advanced Care by Jon Broyles, Executive Director, Coalition to Transform Advanced Care (C-TAC). Bookmark the permalink. Thank you for thanking those who care! Careing one another , that is all about life. Love one another. Happy Caregivers month 2 y’all out there that care, love and give there helping time 2 someone. I was a caregiver 2 my brother up 2 from 2010- Sept. 27, 2015 until he went on 2 b with the lord (R.I.P.). I what 2 thank all that care enough 2 care 4 someone. Love you guys. I pray gallery have a bless and safeven month, season and care. Sure would be nice if the gov’t would fork over a bit of cash to those of us who have given up job opportunities in order to be care givers. For thirty eight years I have done so and been able to keep my daughter off of the public dole. A little help would be nice, but apparently, we don’t qualify. Amen to that. You would think that the government would want to provide assistance to us caregivers who want to keep their parents home while allowing us to keep working. All we ask for is for a little help. It would be cheaper for them to provide us with enough money to pay for someone to come in while we work instead of having to put them in a nursing home. We nearly went broke when my mom needed someone for 6 months a few years back. CAREING FOR SOMEONE OUT LOVE AND JUST CARING. IS A GREAT RESPONABILTY. THINKING WHAT I CAN DO AN HOW I CAN MAKE IT BETTER FOR THEM. GIVING SO MUCH LOVE IN WHAT YOU ARE DOING IS THE BEST EVER. MOST OF ALL IT IS A LOT OF WORK THAT YOU ARE WILLING TO DO FOR THEM. GIVING AND SERVING THEN THE BEST YOU CAN DO IS A GIFT FROM GOD AND I THANK GOD FOR SUCH A BLESSING TO BE ABLE TO DO THESE THING. GOD BLESS YOU AND IF NO ONE HAS TOLD YOU I WILL SAY THANK YOU SO MUCH FOR BEING THEIR FOR THEM. My sister stepped up to help me. I was going to be a homeless veteran. I called her she agreed but I had to move to Michigan from California. The guy I rented from found out told me I had 30 days to get out. Otherwise I had to hit the road. I love her very much. I would like to find out what I can do for her. What a blessing to be able to care for my granddaughter for 23 years. The medical problems are difficult to navigate especially as we are unable to get medical insurance for her. But her smile when I come home from work is all I need to be continually blessed. Why can’t u get her help?? Essays like this are so important to brandeniog people’s horizons. I’m so much more grateful to appreciate all of you caregivers community action. It is much graceful for people to achieve love one another. I was a care giver for my husband for over 10 years. He was in and out of nursing homes and hospitals so many times and I just couldn’t do that to him anymore. so I fixed a room for him at home so he could be with me all the time, he was so happy that it made me cry. I finally did get some help the last 9 months of his life which I was grateful for it. I didn’t mind a bit taking care of him because he was my husband and I loved him very much. H e passed away in 2006 and I still miss him and always will. How did you get helped where did you go to get the help? Thank you for reminding us of the many “unsung heroes” who are caregivers and honoring them with the faith-based community. this is the FIRST time i’ve not been a caregiver for 41 yrs with my husband’s mother, 2 children, my 2 parents, my sister w/breast/liver cancer, and sister-in-law with early onset alzheimer’s disease dying at age 40 due to it. the weight of the world is off my shoulders; stress..wow does that pull us down. i’d do it all over again, but sure would be nice to space these things out without THREE at a time being in critical care! So, if you are a caregiver aren’t you suppose to get paid? Most people don’t get paid, but are rewarded with the great feeling of helping someone in need. God takes care of those who do His work here on earth for Him. So, He knows about you and has great rewarrds for you someday. Keep strong, pray and have faith. These are the real heroes & sheros! Thanks Jon for the super work that CTAC is forging in the USA! I found out the hard way that I was Bipolar I (severe) in 1997. It is classified as a mental illness but has a host of physical symptoms. I tried living by myself, but I couldn’t. I have very little memory, uncontrollable tremors and suffer from deep depression and overactive mania. My brother took me in and cares for me. I would probably be dead by now if he wasn’t in my life. I love him dearly and am healthy and happy because of him. My mother cared for my father for over 40 years after he had a heart attack in 1975 dad is gone now. I would have had to move in with her and she would have had to start all over with her youngest son had it not been for a very sweet woman whom I fell in love with about a year before I got so sick I couldn’t work or live in my own house and care for myself. social security has done nothing for me in two years. Has paid for nothing. I worked for forty years and I’m not yet 55 years old yet. my life is a shambles and I only have one person to thank for that, my lovely lady. I know sometime I will win the pittance payment from social security when they have finished this political game till then I cannot give god thanks enough for my guardian angel in my time of need. Had it been that I needed to wait on social security I would surly be dead. before I got anything I needed to live and or survive. god bless the health care givers. Paid or not paid they are the real heros when it comes to taking care of the needy. the government drags their feet so long people give up. some even die. these people turning down people sighning up for ssi di need to remember someday they may be on the receiving end of this foot dragging routine. god bless. from a person that ended up almost dying on 20 different ocations and has every organ in my body is damaged yet I am still able to work according to SSI DI. if I was 210 pounds in my 5’5″ frame I would be able to collect a check, because I would be too fat to work. damned luck of the draw cant get fat no matter what I eat. oh well Ill stay slim and mabe before I die I’ll collect one check to pay my sweet heart for all her kindness. CARE GIVERS: ROCK. 2012 I was in a near fatal crash,flown to UC Hospital in Ohio. I and my friend fought hard to live. My girlfriend and my friend helped me with my physical therapy, and my girlfriend helped me with home physical therapy,and the 4 more surgeries i after the wreck. Regina at the time of my wreck was also taking care of her mom who had Demetcha. She also lost her father a few months before. Been 3 years and she has been terrific through all of my disabilities. And I also lost my brother and father less than a year that i finally got to come home. Her and Ellen and there family are my HERO’S. Lord please help all of us through these time of needs and our family and friends. You don’t get to make the calls on your life. U or other people can change your life before you can do a thing about it. Shelley my passenger has brain damage and pain still from her injuries. We both stay in touch and i go see her as much as I can. Why this site don’t have different languages? We do! For Social Security information in other languages, please visit our Multilanguage Gateway web page. I just wanted to know if glaucoma is a disability I can put in at SSI. My doctor told me not to drive especially at night! ! Thank you for your question Felix. Our Listing of Impairments describes, impairments considered severe enough to prevent an individual from doing any gainful activity. Remember that disability benefits are paid to people who are unable to work because of a medical condition that is expected to last one year or more or to result, end in death. Social Security pays only for total disability. No benefits are payable for partial disability or short-term disability. We pay disability benefits through two programs: Social Security Disability Insurance (SSDI) and Supplemental Security Income (SSI). If you think you are disabled under our rules, you can apply for disability online. That’s a mo-erbleakdr. Great thinking! Peace and love to all the caregivers in the world.. Love all of you! All us bloggers who are wihnsig they were closer should meet up virtually.Lots of us have gotten to know Bloggers from your side of the world from past sscs’s. It would be fun meeting together. I don’t know who to talk with in regards to my SSI and my retirement check. I started off in life working in the US Army, then I worked jobs it seem every wre, but now the SS check I receive is only $270.00 dollars per month and the SSI I am paid is only $13.00 dollars. I have worked hard all of my life from ( 14 ) fourteen. I am seventy – two years old now and I don’t have any saves and can not even pay my bills each month. When I pay for food, lights water bills I don’t have any money left over for anything else. Is there anything I can do now at my age to even live. I don’t get any help from anyone and I wish I could go back to work. but my health won’t allow me to work anymore. Can you tell me how I can get help from anyone? You you and may God always bless you and all other that are trying to just make it from month to month. Hello Mr. Causey, some individuals may be eligible to receive assistance from the state in which they live. These services include Medicaid, free meals, housekeeping help, transportation or help with other problems. You can get information about services in your area from your state or local social services office. You can also visit the U. S. Department of Health and Human Services (HHS) web page for more information. We hope this information helps. Hi Mattie, you may have to contact your local social services office, or you can visit the U. S. Department of Health and Human Services (HHS) web page for information on this topic. I have been my husbands caregiver since his heart attack in 2009. Is there anything I can get paid for doing this? Thanks for your question. We do not pay caregivers. However, you may be eligible to receive social services from the state in which you live. These services include free meals, housekeeping help, transportation, or help with other problems. To get information about services in your area and find out if you qualify, you will need to contact your state or local social services or welfare office. We hope this helps! Are there any programs that help pay for family caregivers? Is there a program that pays you to be a caregiver? Hello Debbie. Some individuals may be eligible to receive assistance from the state where they live. You can get information about services in your area from your state or local social services office. You can also visit the U.S. Department of Health and Human Services web page for more information.